Home Buyer Information | Desert Dream Realty Cave Creek | 480-252-8300 | Find Your Dream Home with Us! Need mortgage assistance, but don't know where to turn? We can help you choose which program would be best for you. View our videos and learn more about down payment and closing cost, grant and loan assistance programs. In the ever changing real estate market, it is essential that both buyers and sellers stay apprised of all local real estate trends. This free market update will keep you up to speed with regional real estate market conditions and will help provide you with outstanding local home buying and home selling resources. Here are links so you can search for your Dream Home. You can search through our residential listings, search all homes for sale by city, county, subdivision or zip code or search by interactive map. When you are buying a home, do not settle for just an average real estate agent, you deserve the best REALTOR! Buying a home is a HUGE undertaking and you will need a professional. Learn how to choose the right real estate agent for you by watching the video. Also learn why you should choose Desert Dream Realty to be your buyers agent. Did you know you may be considered a first time home buyer if you have not owned any property in the last 3 years! Here you will find helpful links and information for first time home buyers. Receive a free guide about buying a home, choosing a home, mortgage information and answers to common home buyer questions including benefits of owning a home. Here you will find information and tools about buying a home. Understanding a little bit about the home buying process can help you make a sound decision. Our home buyer learning center has home buying articles, guides, real estate and glossary terms and more education about the home buying process. Follow Carol are she goes on her home buying adventures and see what you can learn along the way. This section can help you have a successful mortgage transaction. There are mortgage calculators, shopping worksheets, checklists and other mortgage resources. 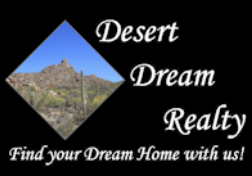 A list of Desert Dream Realty preferred vendors. Information about relocating to the Phoenix area and the surrounding communities of Phoenix. Here you will find school information, demographics, community links, homes for sale or rent and more.